As communications between countries continue to grow, so does the need for increasingly complex satellite systems. To meet that need, the International Telecommunications Satellite Organization (INTELSAT) signed a contract with Hughes Aircraft Company, known later as Hughes Space and Communications Company in 1982 for the most sophisticated commercial communications satellite program ever undertaken. The resulting spacecraft were, at the time, the most complex and most massive ever built. A team of top international electronics and aerospace firms joined with Hughes in designing and building the Intelsat VI. These firms are British Aerospace in England, Spar Aerospace Ltd. and COM DEV in Canada, Thomson Tubes Electroniques and Alcatel Espace in France, Alenia Spazio in Italy, NEC in Japan, and MBB Dasa and AEG-Telefunken in Germany. Using sophisticated digital modulation techniques, each Intelsat VI spacecraft can carry the equivalent of 120,000 two-way telephone calls, as well as three television channels. Each satellite contains 48 transponders, 38 operating over the C-band portion of the frequency spectrum and 10 in Ku-band. The transponders are interconnectable using either static switch matrices or a network that provides satellite-switched time division multiple access capability, a major new technology sponsored by INTELSAT. The heart of the system is a microwave switch that hops among six coverage regions, with connection times as short as 4 microseconds per burst. This feature greatly enhances the channel-to-channel interconnectivity between the users. A large C-band (6/4 GHz) hemi/zone antenna system is featured, with each antenna simultaneously providing two fixed beams for hemispheric coverage and four isolated beams for zone coverage. The zonal beams are reconfigured in orbit to match one of the three INTELSAT service areas--the Atlantic, Pacific, and Indian ocean regions. In addition, Intelsat VI carries Ku-band (14/11 GHz) spot beam antennas steerable in orbit, C- and Ku-band Earth coverage horn antennas, and a pair of C-band omnidirectional antennas for telemetry, command, and ranging. The Intelsat VI solar panel output provides more than 2600 Watts of dc power at the beginning of life. During solar eclipse, when the spacecraft passes through Earth's shadow, two nickel-hydrogen batteries automatically supply power to the spacecraft for uninterrupted service. The first spacecraft in the series to be launched was Intelsat VI F-2, which was lifted into space 27 October 1989, aboard in Ariane-44L H10 booster from Kourou, French Guiana. It is now in operation at 63 degrees East longitude over the Indian Ocean. 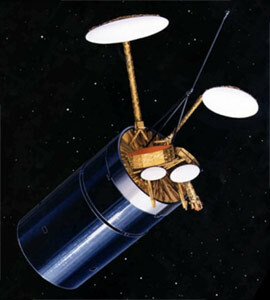 Intelsat VI F-4 was launched 23 June 1990, aboard a Commercial-Titan-3 [Orbus-21S] rocket from Cape Canaveral, Florida. It also is over the Indian Ocean, at 60 degrees East. Intelsat VI F-5 also was launched aboard an Ariane-44L H10 rocket, on 14 August 1991, and is in service at 335.5 East over the Atlantic Ocean. Intelsat VI F-1 was launched 29 October 1991, also on an Ariane-44L H10 from Kourou. It went into operation in late March 1992 at 332.5 degrees East. One satellite, Intelsat VI F-3, was launched aboard a Commercial-Titan-3 [Orbus-21S] from Cape Canaveral 14 March 1990. However, the second stage of the booster failed to separate from the craft and its perigee motor. INTELSAT controllers commanded the spacecraft to separate from the combined booster stage and perigee motor, allowing the satellite to be placed in low, but nonoperational, Earth orbit. It remained there for two years, until the first flight of the Space Shuttle Endeavour in May 1992. INTELSAT had contracted with NASA for the mission, during which three astronauts captured the satellite and attached a new perigee motor to take it to its proper orbit. Hughes provided the motor, hardware, and technical assistance for the mission. The F-3 satellite was put into service over the Atlantic Ocean at 325.5 degrees East in July 1992, in time to carry television coverage of the Olympics in Barcelona, Spain. The satellite weighs 1910 kg without propellant. Stowed for launch, the satellite is 5.3 meters tall; its diameter is 3.6 meters. Its antennas and solar panels are folded into a compact arrangement, with the outer cylindrical solar array placed over the inner array and main body like a telescope. A liquid bipropellant subsystem provides apogee boost to place the satellite into final geosynchronous orbit. This subsystem also performs stationkeeping functions. In final orbit, the antennas are deployed. The outer array is extended downward, exposing the upper solar panel and lengthening the spacecraft to nearly 39 feet (11.7 meters). Intelsat 603 was retired in 2015 and was moved into a graveyard orbit above the geostationary belt.